Power Politics serving the public interest ! Iwish to congratulate your esteemed news magazine on the eve of its current tenth anniversary issue. 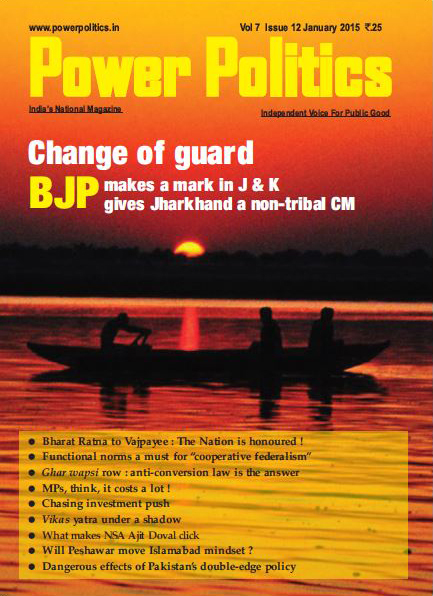 Your magazine has filled in a great gap in Indian journalism today. When most of the media outfits are out to indulge in reporting and analysing the events of national and world affairs with ulterior motives, you have continued to be non-partisan serving the interests of the public in the truest of the spirit of the media in a democracy . Please keep it up! 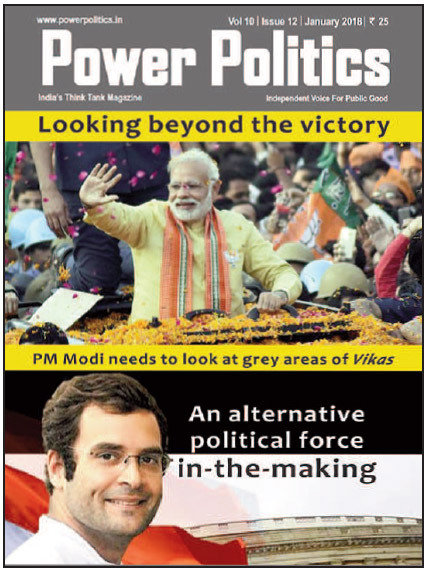 In the January issue of your magazine, your reports on the emerging signals from the recent Gujarat and Himachal Pradesh Assembly polls are a clear reflection of the glorious pattern you have adopted in your media practice. I am in agreement with your assessment that electoral battles are fought along different ideological issues and considerations in our national and state elections. But the outcome of neither can be without its impact on the other in due course. The election results in the Assembly polls in the two states are likely to affect the contours and consequences of the Lok Sabha elections to be held in 2019. The outcome of these elections really shows the people are being increasingly disenchanted with both the ruling Bharatiya Janata Party and the main Opposition Congress Party at the Centre. The saffron brigade does not enjoy the kind of popular support it had during the past couple of years. The premier Congress Party is being rejected as it has long been mired in monumental corruption. You have rightly stressed that democracy is inherently against any personality cult . If there was any cult of this kind after the emergence of Narendra Modi as the Prime Minister at the Centre, it has started fading across the country. Prime Minister Modi is no longer invincible as he was often projected to be. The emergence of main Opposition Congress Party leader Rahul Gandhi on the national scene is a positive sign for the health of our democracy. I hope he would work harder in the interest of the people and contribute to the process of building our democracy in a meaningful manner. Also, you have rightly pointed out that all is not well with the Modi Government's management of our economy. The government is aiming to boost growth with massive public spending on infrastructure. It claims to bail out banks burdened with huge bad debts. But measures such as demonetisation and the GST have disrupted the country's economic momentum. Demonetisation wiped out 1.5 million millions jobs between January-April alone. According to the Global Hunger Index (2017 ), prepared by the International Food Policy Research Institute (IFPRI), India ranks 100 in its list of 119 countries . India still faces a problem of undernourishment and poor child health. Over 45 per cent of our child mortality is due to hunger or undernutrition. On the other hand, the index shows our capita food production increased by 26 per cent during the period 2004- -14). It has doubled in the last 50 years. The National Sample Survey Office data on Household Consumption Expenditure indicate that 72 per cent of India's population consume less food than required to meet the calorie norm specified as standard. Clearly, our growth in food production has not adequately reduced our hunger . The political leaderships at the Centre and in the States must hang their heads in shame. The gap between our food production and its availability to the masses is due to corruption prevalent in our administration. In order to make democracy meaningful, our leaderships must sit up and act. Citizens must be vigilant and elect the leadership that translates scientific progress into fostering the happiness of the people in India. 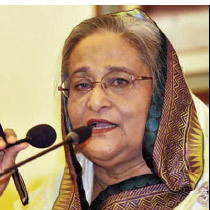 Sheikh Hasina The recent agreement between Bangladesh and Myanmar on the repatriation of more than 6,20,000 Rohingya refugees is the call of humanity . A joint working group including officials from Bangladesh, Myanmar and the United Nations High Commission for Refugees (UNHCR) is being set up . 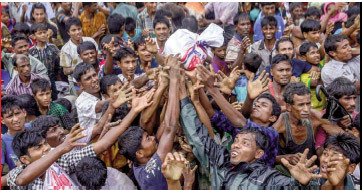 It is heartening to learn that Myanmar is in the process of repatriating the refugees. I hope things would move forward to the betterment of the people suffering on this front. Aung San Suu Kyi Bangladesh Prime Minister Sheikh Hasina. In September, the Human Rights Council in Geneva voted to extend the mandate of an international fact-finding committee to investigate allegations of human rights violations in Myanmar. The UN General Assembly's Third Committee voted overwhelmingly in c o n d e m n i n g Myanmar's actions. In the recent past international human rights agencies called for targeted sanctions and an arms embargo against the Myanmar security forces. 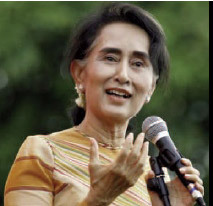 Myanmar's leader Aung San Suu Kyi faced international criticism for not stopping the violence. Several awards and honours given to her for her work in restoring democracy were revoked. Medical council of India The decision of the Lok Sabha to send the National Medical Commission Bill to a standing committee for a relook is a right step. 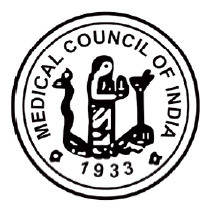 Presently, the Medical Council of India regulates our medical education and practice. We all know how it has worked over the years. There is rampant corruption in the body. This has to be addressed. But the present Bill does not seem to offer much hope. It is disheartening to learn that there is a provision herein for a bridge course. That will be allowing alternative-medicine practitioners to prescribe modern drugs. This can be dangerous . Medical practitioners We need more allopathic doctors in rural India. Current MCI regulations are very rigid. They prevent even experienced MBBS doctors from carrying out procedures like caesarians and ultrasound tests. They bar nurses from administering anaesthesia. This must go. We may also think of a diploma programme for rural medical-care providers along the lines of the Licentiate Medical Practitioners who practised in India before 1946.